I’m doing an experiment today. I’m covering a damp clay sculpture with paper mache, because I want to ship the paper mache head to my Dad in Washington. The water-based clay is heavy, and it would probably get ruined if I tried to ship it anyway. I’m using the fast-setting paper mache paste and shop towels that I use for my paper mache masks, but I’ve never tried using them over anything other than modeling clay or Super Sculpey — and I’ve never tried using them on a piece that will need to be cut apart and put back together again after the clay has been removed. I sealed the wet clay with wax, but I won’t know until tomorrow if the wax sealed it well enough to allow the paper mache head to dry. We know that paper mache over modeling clay works for masks, but if we can also get it to work in the round, (if the pieces go back together again without the shape getting distorted), it means we could make a permanent copy of any clay sculpture without first making a complicated multi-part mold and pouring plaster – or firing them in a kiln, or hiring the services of a bronze foundry. Cheap art, simple art, without armatures made out of crumpled paper or masking tape. I like it. 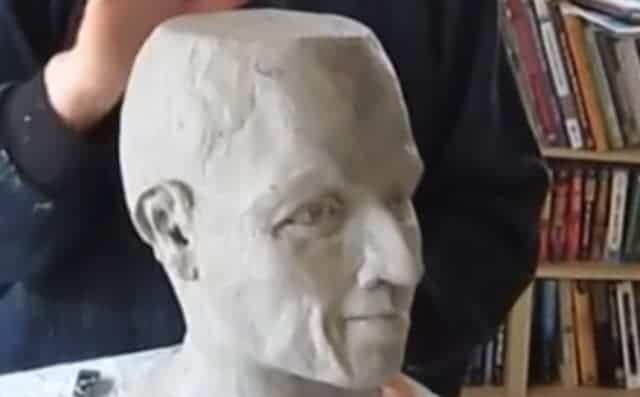 Just in case this paper mache head experiment actually works, I hope you’ll start thinking about how we could use this process for other sculptures, and how we could fill the hole left after the clay is removed. Small sculptures could be left hollow, but larger ones would need some inner support. Ideas? Hello Jonni, I came across this video on YouTube as I was searching for a way to make hollow sculpture from paper Mache. I love this experiment and would like to try it myself. Could you please tell me what kind of wax did you use and where to buy it? Thank you so much. Your works are wonderful. Hi Phiona. I used paste wax that is used for furniture. They sell it in hardware stores. One of my readers suggested that petroleum jelly would work better, and I think he was right. That’s what I use now, instead of wax. Thank you so much Jonni. Thanks to you, now I shift my interest from drawing and painting to sculpture :D.
I have a question about your paper mache head experiment. Would this technique work if I paper mache a resin skull? I came across some interesting ‘masks’ of peoples faces hanging from a tree in a park. The masks were made of what appeared to be metal screen, but definately different individual faces. What kind of screening could this be? The Amaco Wireform mesh was my uneducated guess. I would like to send the picture I took so you can evaluate. What do you think the process was for doing these simple looking ghostly masks? And how do I send the pic? More about better living through chemistry…About ten years ago I filled the void between a thin papier mache shell and a bike helmet with spray foam. It was a failure as a solution to my problem because the foam seemed to expand and contract with the weather. It took months, if not years, to stabilize. (Surely a masochist, I kept it around for observation.) I had greater success with a cast latex flexible slip shell but I could still feel the air pockets and there was some distortion though not so bad as to ruin the piece. I think the rigidity of the outer shell may be the greatest predictor of success. Even so, I would not try to fill a large piece all in one go especially if there are seams. If the outer skin sets up before the middle, the uncured foam trapped in the interior can do some really odd things. If the piece was really large, I’m imagining something barrel-like with easy access, I’d tip it on its side and lay down a single layer, let that set up, roll it over and spray the next section, etc. These days I use spray foam to glue large chunks of expanded polystyrene to each other and to wire mesh armatures. Really works like a dream for that. Thanks, Ann, for sharing your experiences with the spray foam. One of these days I want to try using it with wire, just to see what happens. If the inside stays hollow, that might avoid some of the weirdness of the stuff. Nu Ã¤r jag Ã¤ntligen nÃ¥got Ã¥terstÃ¤lld efter en influensa och ska sÃ¤tta fart med min katt. LÃ¤ste hur du vill fylla formen med skum och Ã¤r rÃ¤dd att sÃ¶mmarna spricker och dÃ¥ fick jag idÃ©n att stÃ¤lla formen upp och ner i en lÃ¥da med tillrÃ¤ckligt mycket sand. Good idea, Gisela. (I love Google Translate!) Fortunately, the folks who sell the foam tell me I’m worrying unnecessarily about the foam popping the paper mache apart. As long as there’s a way for the foam to expand, like a hole at the bottom of the sculpture, the foam will expand in that direction instead of trying to get out the sides. Or, at least that’s what people keep telling me. I’ll order some foam today and try it out. This might not work, but…you could stuff the interior of the head with fiberfill. It would be quite strong if packed tightly, and you wouldn’t have to worry about additional expansion, or weight. I enjoy and admire your projects! Thanks. Interesting experiment. I’m eager to see how this goes. A question – paste wax dries pretty fast, rather like a varnish, right? I guess it doesn’t matter since it’s purpose here is simply to seal the clay. Your sculpture looks really great Jonni. I’m hoping everything works out…I’ll cringe if your original sculpture is ruined. Of course this may get a little pricey, but what about that expanding foam like is used around windows? It probably would be lightweight, but fairly strong. Hi Terry and Dee. I’ve thought about using foam – maybe the kind you mix up yourself instead of the spray kind. The thing that worries me is that the foam might keep expanding and pop apart any seams, or just distort the shape from the inside. I’ll send an email to my local Smooth-on distributor and see if she can recommend something. It wouldn’t be cheap, but it wouldn’t cost as much as buying a kiln or having a sculpture cast in bronze, so I guess it’s all relative, right? Hi Jonni, I was thinking that if you started at the furthest point away from the hole and kind of went slowly, maybe the foam would expand INTO the center space and you could slowly just fill it up to the point that it would keep the shape and protect from bumps. Maybe we won’t really know if it works until someone tries it. Unfortunately at the moment I don’t have any hollow heads to play with. I must watch the video now! Yes, I think that could work. I will try it, but perhaps not this week. There’s a costume tutorial where the guy uses ‘great stuff’ inside his form. He has a pretty detailed tutorial about it. I suspect a Smooth-on product would be easier (single application possibly) … but here’s the link in case you’re interested. Thanks for the link. I think the advantage of the pouring type is that you can swish it around in the form to make sure it gets into the ears, etc., but for small projects it might not be worth the expense. If I ever get started with my figure sculpture, it will be a good project to try this on. I used expanding foam very sucessfully to fill hollows of my Seahorse and Life sized people models. you need to have at least one out let hole to allow the foam to escape and cover surfaces around the holes to protect them. Resist the temptation to touch the expanding foam until it has set as its very sticky. Once it has set hard it can be cut or sanded easily. Its really useful to hold together a mass of internal wire and it makes the sculpture really strong as the weight is evenly distributed butit doesent add much weight. I Highly recommend this proven method and cant think of anything else that would work as well but be warned the foam will spread, a little goes a long way. Good luck – my lates figure Unah is on my website now http://www.hazelbryce.com but she was a smaller figure at only 2ft high and much more of a challenge than a life sized figure. Thanks, Hazel. This is good to know. And your new Unah sculpture is lovely.